All of us pet lovers know it quite well, that smell of our precious pooch or cute kitten, reports The Early Show resident veterinarian Dr. Debbye Turner. But how much odor is too much odor when it comes to the family pet? Dogs and cats do have certain smells that are natural and normal. In fact, in the wild, an animal's smell is his "calling card." 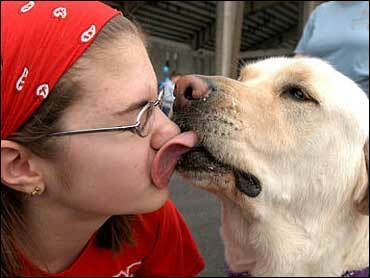 Just like we identify each other by the way we look, animals identify each other by the way they smell. Their bodies produce oils, phermones, and other odors that send out a number of messages to the world around them. Those messages vary from 'back off, this is my territory' to 'I'm in the mood for love, come see me' to 'I'm afraid, don't hurt me.' Also, some odors could indicate illness in your pet. So it's always important to consult your veterinarian when you smelly something unusual on your pet. Bottom line, under normal circumstances it is not realistic to expect your dog or cat to have no odor whatsoever, but with proper grooming, your pet's smells won't be so offensive that you can smell them from a mile away. It is not the least bit cute to us, but dogs seem to revel in rolling in feces (poop). The conventional wisdom is that dogs would roll in another animals feces to mask their own scent while hunting, thereby, confusing their prey and giving them a better chance of making the kill. So this disgusting behavior had a place when dogs lived in the wild. Now, it mainly just grosses out dog owners! There are hundreds, if not thousands, of shampoos out there for dogs and cats. Most groomers agree that shampoos with all natural ingredients are best. While those with heavy perfumes will make your pet smell good right after the bath, that perfume smell won't last long. So the scent of the shampoo is really a matter of personal taste. Keep in mind, that your dog may not appreciate smelling like perfume and be more motivated to find a pile of poop to roll in, in order to get rid of that perfume smell! You can be sure that your dog's skin oil glands will start working right away after a bath to restore moisture to the dog's skin. So your dog will go back to smelling like "a dog" soon after the bath. Shampoos with oatmeal are great for pets with itchy or irritated skin. The oatmeal has a soothing effect. It is important not to overbathe your pet. Dogs will need a bath more often than cats. I really wouldn't recommend bathing your dog more than once a week. This could cause dry, itchy skin. And many groomers recommend bathing a dog every 4-6 weeks. Cats are pretty good self groomers, so they need a bath even less often. Probably once or twice a year for a cat is all they need. For most cats, a bath is a terrifying experience, so it may be best to leave this chore to a professional groomer. But if you start bathing your cat as a kitten, she will learn to tolerate the experience. There is almost nothing worse than putrid doggie breath. Just how much bad odor should your dog's breath have? There is a difference between "normal dog breath" and really bad breath. Your dog's breath should not smell like something dead is in there! Bad breath could mean an array of problems that should be addressed. Bad breath could indicate gum disease, diabetes, kidney disease, or a foreign object trapped in the mouth. Have your veterinarian rule these things out before just giving your dog a breath freshener and moving on. Many groomers sing the praises of "greenies." These are pet treats made with vegetable that help keep the teeth clean and freshens the pet's mouth. Some groomers recommend giving your dog carrots to help with bad breath. Just don't give too many. You don't want your pet to get fat. As for all those pet breath mints out there, they will help -- for about 5 minutes. But they don't get to the heart of the problem. The best thing you can do to help with offensive pet mouth is to keep their teeth clean. Be sure to have your pet's teeth professionally cleaned at least once a year. If you can start when your pet is young, you can train them to tolerate having their teeth brushed by you. This is a great way to fight tartar and gum disease between professional cleaning. And for those who would scoff at keeping their pet's teeth clean, let me just tell you that periodontal disease can lead to heart problems. The bacteria that is in the tartar can get into the bloodstream through infected gums. This bacteria can lodge in the heart and cause a life-threatening disease. So keep your dog's teeth clean! The ears of your pet are quite susceptible to infection and disease, especially in dogs with long floppy ears, because the external ear canal generally doesn't get much light or oxygen (two of nature's best disinfectants). If you notice your pet pawing at their ears or tilting their head to one side, take them to the veterinarian right away. Ear infections are very painful and can lead to permanent damage. Some of the problems that would require veterinary attention include a yeast infection, or ear mites. To prevent these and other problems, cleaning your pets ears is very important. Use a solution specifically for cleaning the ears. Squirt a liberal amount just inside the ear chamber, massage the ears a bit using the skin around the ear, then dry the ear canal thoroughly with a cotton swab. The groomers don't seem to agree about how to get the awful smell of skunk spray out of a dog. Some say the soaking a dog in tomato juice will do the trick. Just beware, the tomato juice will stain white or light colored dogs. You'll end up with a pink or orange pooch. Those who subscribe to using tomato juice say that the trick is to use a lot, and let it sit on the dog for 10 minutes or so. Then wash it out thoroughly with dog shampoo. Other groomers say tomato juice doesn't work and only discolors your dog. One recommendation is to use Dawn dishwashing liquid. Suds the dog thoroughly, let it sit for 5-10 minutes, then rinse thoroughly. Some groomers recommended Nature's Miracle Skunk Odor Remover. Other remedies include using Massengill (the feminine cleansing product) and vanilla. One veterinarian recommends using 2 ounces of Massengill with one gallon of water. Let this soak on the dog for 15 minutes, then rinse, shampoo, and rinse again. Another veterinarian recommends 1 1/4 cups of vanilla in a gallon of water. Let this soak for 10 minutes, then shampoo and rinse. This solution could be a bit expensive. But your dog will smell delicious! There are quite a number of products on the market that make claims about getting out pet smells from "accidents." Ones that came highly recommended are Nature's Miracle, Nilodor, and Odor Eliminator. As for those "rusty" colored stains on the faces of small, white dogs, regular bathing will help a lot. One groomer recommended Pro-Eye Tear Stain Remover.